Wittmann finishes sixth at his home race. BMW Team RMG driver Marco Wittmann finished sixth at his home race in Nürnberg and, in doing so, defended his lead in the DTM Drivers’ Championship. Joey Hand crossed the finish line immediately behind Wittmann in seventh place. June 29, 2014 - Marco Wittmann was the best-placed BMW driver at his home race on the Norisring, finishing in sixth place. 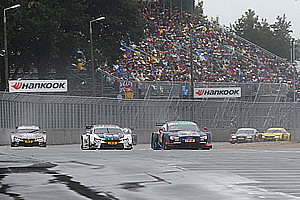 Despite difficult conditions, the local favourite still managed to pick up eight points and continues to lead the DTM Drivers’ Championship with 58 points. Joey Hand, at the wheel of the Crowne Plaza Hotels BMW M4 DTM, also produced an impressive display to finish seventh behind Wittmann on a track that was wet at first but dried out as the race progressed. Victory went to Mercedes driver Robert Wickens. The remaining BMW DTM drivers missed out on the top ten in the fourth of ten races this season. Bruno Spengler finished 11th in the BMW Bank M4 DTM. Augusto Farfus was unable to benefit from an early first pit stop, eventually crossing the finish line 14th in the Castrol EDGE BMW M4 DTM. The two BMW Team MTEK drivers, Timo Glock (DEUTSCHE POST BMW M4 DTM) and António Félix da Costa (Red Bull BMW M4 DTM), came home 16th and 20th. Maxime Martin demonstrated his renowned ability in the wet during the first half of the race, climbing as high as fifth place. However, he returned to the track with wet-weather tyres on the SAMSUNG BMW M4 DTM after his first stop. When the circuit then started to dry out towards the end of the race, Martin was forced to switch to slicks and dropped back into 17th. Martin Tomczyk (BMW M Performance Parts M4 DTM) was forced to retire from the race following a collision with Gary Paffett.